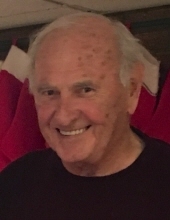 James A. Cochran, 79, of Normal, passed away at 6:30 p.m., Wednesday, February 6, 2019 at his home. Also surviving are three daughters, Kelly (Steve Leason) Cochran and Kristi (David) Locke, both of Normal and Kimberly (Cindy Denby) Cochran of Springfield; two grandchildren, Makenzie (Tyler) Perkins and Maggie (Eric) Seim; two great grandchildren, Tinley and Madison Seim; a brother, Tom (Karen) Cochran of Basking Ridge, NJ; two nieces, Cindy Crimmins and Laura Murray; and two nephews, Brad Cochran and Jeffrey Wills. "Email Address" would like to share the life celebration of James A. Cochran. Click on the "link" to go to share a favorite memory or leave a condolence message for the family.